We often travel to the factory in Waldsassen, Germany, to have custom glass made for our clients. Lamberts glass has a spectacular clarity and range of color. Cindy especially likes their Opals and Opaks, which are colors with a thin layer of white. This layer accentuates the color shading, and really brings out the beauty of the material. Bob shot and edited these videos to help explain to clients the complex process of blowing a flat sheet of glass. Choose the top video for the 1:30 montage of the the steps. Choose the bottom video for a 7:38 detailed explanation of all the steps...definitely worth the time! The factory floor. Blowing starts well before sunrise to beat the heat! Cindy confers with blowing team about a custom run of glass. Glass furnace. It is LOUD and HOT. Worker shapes the glass gather into the perfect shape. The glass on the end of the blowpipe; ready to be blown to size. 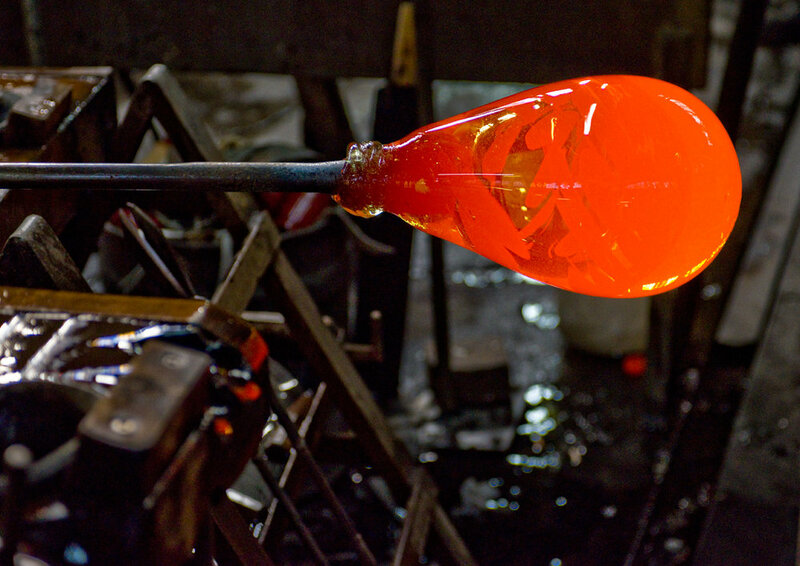 The Master Glass Blower heats the gather to near a molten state. Blowing in a trough gives the glass a cylindrical shape. The ends of the cylinder are heated and cut off. The sides are shaped with a rod. The cylinders are now ready to become sheets! Each cylinder is scored and broken open, lengthwise. Glass is re-heated and the sides fall flat. A worker "irons" out any bumps. Finished sheets are inspected for quality. Glass racked in the warehouse, ready for shipment. Crated and ready for shipment worldwide.